What a terrible backdrop to photograph this, but you get the gist. This is now on a holder and you make another one exactly like it and kitchener them together. I feel like I'm making progress on this one. The pink lace is another matter. That thing is never-ending. I've decided that this shawlette will look great with a yellow blouse. So I'm on a mission to find a nice one. I had fun playing with this last night. I'm disappointed that the brown dots are not more noticable. Oh well, it smells fabulous. None of the bars are cut exactly the same since I have to do it by hand. I used to have a cutter but it got lost over the years, probably thrown out. After looking at these, I realize now that I need some more professional molds and a new cutter. In years past, people REALLY wanted to buy this stuff at holiday time and if that happens again, I need the bars to be uniform in size. They are perfect stocking stuffers and that "little something" to give to people when you need something small. I think I'm getting addicted to this hobby all over again. A little of this... a little of that..
My weekend was filled with a little of this and a little of that and not a lot of any particular thing. I spent a great deal of time with my mother since my siblings were all out of town for the long weekend. We went to and from dialysis, ate a few meals out, shopped for and planted some flowers and visited the graves of my grandparents and my dad. I got the nursery finished. Hopefully Colin and future babies will be comfortable in this room. I think it turned out nice. This will be approximately 35 bars of Lemon Verbena and Plum Spice scented soap with shea butter added. It should be awesome. I embedded some pink and brown "melt and pour" soap dots for a sort of neopolitan look to add interest. Hopefully I'll have some photos of the cut soap later in the week. I'm going to use a lot of this for Christmas gifts this year. In knitting news, I finished the bishop's scarf... must block it soon... and I'm within two inches of finishing the first half of the Clementine Shawlette. So, there was a little knitting too! Candace asked about the yarn I'm using for my Clementine Shawlette. I purchased this yarn at Maryland Sheep and Wool from the Tintagel Farm booth. I haven't done anything with it yet, but I think it is destined to be one of those spiral scarf thingys. (I do have more of it) Gorgeous colors. We got a wedding invitation in the mail yesterday. I love weddings. I hate having a summer go by without attending at least one wedding. So that made me happy. (my husband... not so much!) And I believe we have another one in August to look forward to as well. The parents of both the bride and the groom are friends of ours and the kids have been dating since junior high. I'd say they are about 25 years old now. What a happy day for both families. I did take a few days off work last week to try to get my house in order and I accomplished about 1/2 of what I wanted to. I consider that some type of victory. 1/2 is better than none. We ripped carpeting up in our upstairs hallway, having NO idea what was underneath it. Turns out that it is hardwood that was in great shape... until we got to the bathroom door. Obviously there was some sort of disaster there at one time. I think it calls for new carpeting. I don't think refinishing is the answer. I put a few rows on the Bishop's scarf last night. I hate to pick that thing up. The yarn makes my skin crawl. It actually squeaks. I'll never be so happy to finish something. I should have gone out and found substitute yarn for the sweet soul who requested it. But how do you do that diplomatically? First... the graduate... Congratulations Cate! Way to go. We knew you could do it. I've been asked to knit a prayer "scarf" since the recipient probably wouldn't wear a shawl... being a bishop and all. I was given the yarn to do it. Lion Brand Homespun. I've seen cute patterns calling for this yarn and I've always wondered about it. Now I know. Ugh. The ply separates and bunches up as you're knitting. You can actually see it in this photo. Look at the yarn on the end of the needle. This yarn has been around for a long time in a million colors so obviously someone likes it. What do I know? Actually, when it's finished it will probably look ok and it will be soft. Other than the fact that I will sincerely pray for the gentleman who will be receiving this scarf, that's all I have to say. Big weekend ahead. Cate graduates from the Rock tomorrow. I will work on Mother's Day... clients don't really care that it's Mother's Day, so we will make the most of our day at Slippery Rock tomorrow and call it a family celebration. After all, what could make a mother happier than to see a child graduate from college? I hope all you mothers out there enjoy the weekend. Demand breakfast in bed!!! This is how she's looking so far. This is fun to knit but I wish I had one of those magnetic boards with the strip magnets to move on the chart to keep your place. I'll have to get one of those. I haven't worked with too many charts before so I never had the need but it is hard to keep your place without it. At least it is for me. My eyes aren't what they used to be. I know that Spring and Summer is when people back off a little from their knitting but for some reason, I just want to knit more than ever. I wonder if anyone ever took their vacation days to knit! So where did that year go? #1 Grandson is one. (tomorrow) His party was Saturday so his actual birthday should be rather anti-climatic. Happy birthday little guy! I worked on the Clementine Shawlette all evening last night while watching two movies on DVD. It's been a while since I've seen anything recent so I made one of my rare visits to Blockbuster and rented Little Miss Sunshine and Catch and Release. I loved Little Miss Sunshine. Catch and Release not so much. Kind of boring. And speaking of boring... I had a great suggestion regarding my boring felted bag from Laurie. She suggested I dye it another color. I guess I could probably get it to some sort of a chocolate brown from what it is now. This could be a job for Shelley. Hey Shelley... what do you think? And I've decided I'm definitely going to run it through the washer again. It may turn out smaller than what I wanted, but I'm more concerned about it looking ALL THE WAY felted. One of these days I'm going to have to stop knitting and get my house in order. Really. And my garden. I wish there were more hours in the day. Even though I knew I shouldn't start another project I had to. This yarn was practically jumping out of the bag. There's just no stopping now. My niece made this shawlette from Interweave Knits Spring 2007 for my sister. I just love it. I wanted to do cotton, but when I saw this wool/mohair blend at MS&W, I knew it was the yarn for the project. This little mini-sunflower was a gift from Vanessa (son's GF). It's called a Pacino sunflower and they grow to be 15 to 20 inches tall. Perfect for planters. I'll have to get some more of them. It's adorable. This is it. This is all I bought at MS&W. I'm proud of myself. I don't know what it's going to be yet but I couldn't pass up the colors. Sunday is much more sane there than Saturday. I've always gone on a Saturday before. I will say though that I could tell the yarn had already been very picked over. So I guess if you want to buy a lot, you should go on Saturday. I missed one of my favorite vendors there this year. The Good Shephard. I couldn't find her anywhere. I don't know if she didn't come this year or if I just missed her. She always has great stuff. Below is the finished felted purse. I'll throw it in the washer tonight I think. I screwed up the bottom of it but hopefully you won't notice when it felts. I need to decide what to "stash bust" next. I started a felted bag with yarn from my stash while watching the two hour Grey's Anatomy last night. In two hours it is half way finished. Talk about instant gratification! Of course you know the problem here will be that I'll want to make another one of these as soon as I'm finished with this one and that means buying more yarn instead of knitting with what I have. I will try to resist and begin thinking about what to knit next from the stash. I've decided to allow myself to buy yarn for ONE project at MS&W on Sunday. I still have the yarn, untouched, that I purchased there last year. While I don't plan on a shopping spree, I'm still really looking forward to the trip. It's always nice to spend time with your sister and we don't get to do it very often. Busy.... both of us. 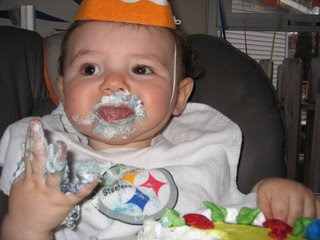 Tomorrow is Colin's one year birthday party. Where did the year go?